The second charity I have chosen to be involved with this season is called the Get Warm Project (running Nov. 1st through Feb. 1st). 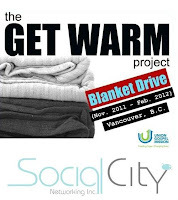 Its goal is to provide warmth for the homeless and disenfranchised in our local community during the cold months. The brainchild of Social City Networking's Krista and Sara McKenna and Shauna Beaudoin of Connekt Marketing, this project offers several ways to be involved. First - you can take a Get Warm Project donation box to be placed at your local businesses, workplaces, coffee shops, schools, events and more. These boxes are to be filled with warm clothes, blankets, winter boots, scarves or personal toiletry items. Donations will be given to Union Gospel Mission to help clients combat the cold and placed in Christmas Hampers. Second - If you do not have time, cash donations are a great way to be a part. They should be made at the Union Gospel donation page. Cash donations allow the organization to purchase the items most needed to meet the needs of their clients. 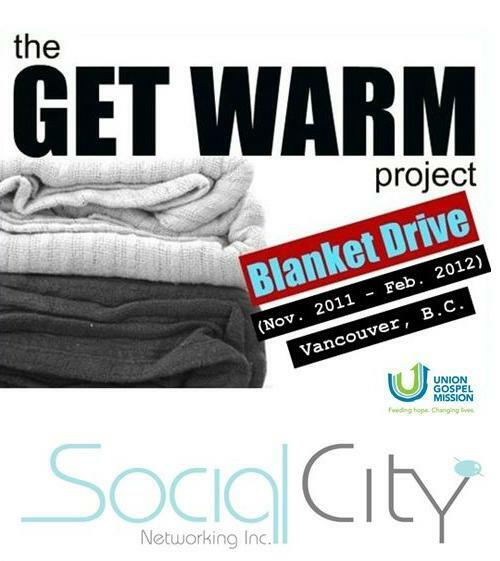 Third - Those who are social media savvy can help by spreading the word by liking and sharing the Get Warm Project Facebook group page. My involvement in this project was a journey. As funds were limited, I was concerned about my ability to make a significant contributor so threw caution to the wind with an internet search - POLAR FLEECE FOR $1. I not only found a source, but it was near my home. A local upholstery business had bought a bulk grouping of fabric which included quite a bit of polar fleece which they needed to dump. Off I went with funds from both myself and a friend, jeweler Pam Jackson of Street Cat Designs. 170 yards (supposedly) of polar fleece in red, yellow, blue and green were packed into my little Yaris. Then it was a full day of cutting the fabric into 2.5 yard blankets. The only downer was the seller thought he knew the amount on each bolt and he was wrong by a lot. Instead of 74 blankets, I only ended up with 60. The enormous pile of colourful blankets on my dining room table brings a smile to my face each morning. Next comes the real joy of delivering this pile of soft, warm donations to the charity for distribution. It's great to make one of the early contributions to a campaign like this and be part of starting its momentum. 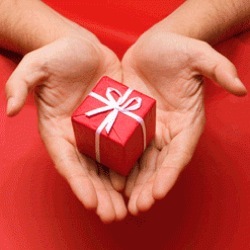 Again, it is the season to be thankful for all you have and to hopefully find a way to spread the good will to others. Just look around you and see where your heart leads you.